In what is being interpreted as a deliberate delaying tactic for postponing Narmada Bachao Andolan (NBA) leader Medha Patkar's release from Dhar jail, the Madhya Pradesh did not produce the case diary regarding her arrest under section 365, kidnapping, on Monday. In a statement issued soon after the failure to produce the case diary, NBA said, "The office of the Advocate General deliberately misinformed the Kukshi police station to produce the case diary (case No. 9029/17) on August 22, and not on August 21, the day of the hearing." It added, "Senior advocate Anand Mohan Mathur brought to notice this delay to the court at 10:30 am and requested to proceed with the trial. The Honourable Justice then asked the government lawyer to arrange the case dairy by afternoon and adjourned the hearing till then." Yet, said NBA, "Till 4 pm, government lawyers didn’t produce the case diary in a clear attempt to delay the hearing in the matter", adding, as per the information it has received, "The hearing of the case has now been rescheduled to August 23." "This only shows the desperation of the government and every attempt at keeping Patkar in jail", NBA said, insisting, "The governments delaying tactics are not going to dampen the spirit of our struggle. They can delay proceedings but can’t defeat us." 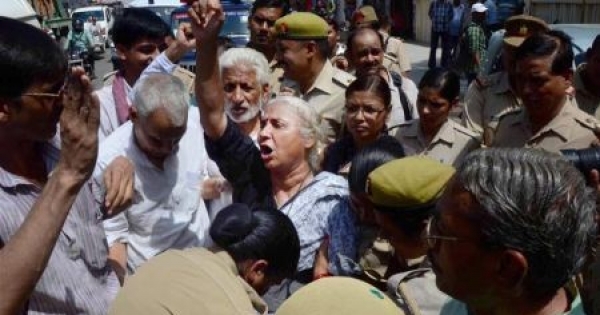 According to NBA, the Madhya Pradesh government has been seeking to delay Patkar's release ever since she was arrested on August 9. "She was jailed after her release from the Indore Bombay Hospital on the same day. Since that day, the administration has wilfully delayed and also imposed a number of false charges against her including that of kidnapping government officials on the seventh day of her indefinite fast." "Last week, she was produced in the Kukshi court through video conferencing after a day's delay on account of link failure, and she was denied bail. Even today, the government delayed the bail proceedings in the Indore High Court by not producing the case diary", NBA said. Meanwhile, protests continued across the Narmada valley for the release of Patkar and her colleagues. On August 19, 5,000 people marched to the office of the SDM, Kukshi, and submitted a memorandum detailing about the "illegal arrest" of Patkar, Santu, Vijay, and Dhurji, and asked for their unconditional release immediately. The march was organised as part of the jail bharo andolan by NBA, challenging what it called "numerous false cases" filed by the Badwani and Dhar police against 2,500 people from different villages. "These are nothing but the intimidation and an attempt at muzzling the dissent and provoking the non-violent struggle of the people", it added. This was followed by a letter writing campaign to the Prime Minister in the villages of Narmada valley demanding withdrawal of all criminal cases and unconditional release of Patkar and others. 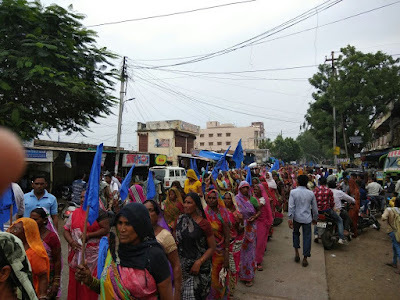 Even as parallel demonstrations were held for Patkar's release by several other organizations, including the Kisan Sangharsh Samiti, reports say, the arrest of villagers‐activists -- Durji (village Nisarpur), Devandra (village Nisarpur) and Vijay (village Khaparkheda) -- on the basis of charges like ‘attempt to murder’ continued. In the past one week a large number of FIRs have been filed against key NBA activists on these lines. An online petition has been floated by a Patkar fan, Kamayani M, asking the Madhya Pradesh government to immediately release Patkar and others.